Reading consists of 3 to 5 passages of text and 40 questions in total. The Academic Reading test has 3 longer passages, whereas the General Training Reading test can have 4 or 5 shorter passages. Your job is to read the passages and either answer questions, label diagrams, complete sentences or fill in gaps. For every type of task there are instructions and an example. Passages are taken from books, newspapers, magazines and the topics are very diverse, from scuba diving to space exploration. Passages progress in difficulty, with the first being the easiest and the last being the hardest. Good news is that you don’t really have to read the whole passage, thanks to a technique I will refer to later. Not so good news is that there is no additional time to copy your answers to the Answer Sheet and you need to squeeze it in the 60 minutes that you have in total for the Reading test. Please, don’t forget to do it – I witnessed someone who did, and it was not a pretty sight. The poor guy was crying, he received a score 0 for the whole Reading test. Here too you may write in pencil only, no pens are allowed. Four passage for reading? Is it old IETLS system? Like, I heard there will be three passage each caries 20 minutes. Anyway, here you’re telling that need not read whole passage and still we can crack, how? Please suggest me..
Once again, you didn?t say what kind of IELTS you are speaking of. In the post I am referring to General Training IELTS. In General IELTS the Reading section is a bit different from Academic. Academic IELTS supposed to include 3 passages of progressing difficulty, the last one supposed to be the hardest so it is a mistake to divide time in 3 equal portions of 20 minutes. In General training there probably will be not less than 4 smaller passages that also get more and more difficult, the first one is the easiest and the last one is the hardest. 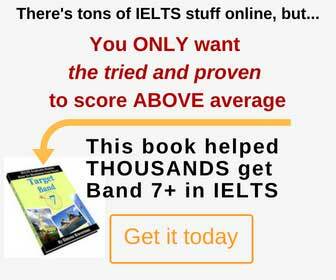 Now, I think that it would be better for everyone if I just added another post with tips for IELTS reading. So please-please-please be patient for another day or two ? the next post will be about Reading. Dear, First of all, let me sorry, I didn’t knew you’d posted about general. yes, I am preparing for academic, and it will be helpful for so many people if you please post a particular post on “Cracking Academic Reading”. Thank you very much!! Hello, Pls let us know the technique of general reading. As u said no need to read whole passage, could u please let me know.